I've been in Hamilton almost three weeks now. I have noticed a lot of nice things about this city. All the green space, the people who don't seem to be born hating life, a backyard for our puppy so we don't have to have awkward dog park encounters. These sorts of things. But there is one big, huge, un-ignorable, fashion faux pas I have seen over and over and over in these parts. I'm not any sort of fashion expert, BUT I do know this one simple irreversible fact that Hamiltonians do not seem to realize. PAJAMAS ARE NOT EVER EVER EVER OUTERWEAR. Zipping to Walmart? Nope, not appropriate. Heading out to grab something quick from the grocery store? Still need to wear pants. Going to the mall to do Christmas shopping? Out to the movies? On a fancy date? Picking up drive thru McD's? What do all of these activities have in common? You cannot wear bedroom attire. My standards are not high for fashion. I will put up with tights and too short shirts even though tights are not technically pants. I can handle sweatpants of all sorts. 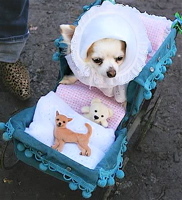 Even little dogs in their own crazy cart contraptions used as fashion accessories (photo of 'dabie' provided by this blog). These things are all tolerable. But not pj's. O please stop the madness Hamilton. For me. My delicate Toronto eyes are not used to such abominations. In order to properly adjust, ease the culture shock, I am begging you, when you are setting out for the day, and you change your slippers to something with a harder sole, and you brush your teeth (o please be brushing your teeth), and you feel like you are forgetting something, look down and make sure that you are wearing something on your bottom half that is not plaid, or has cute little flannel coffee cups, or sparkles and strips. Thank you. Have I never taken you to Dance Cave?? Have you never seen the infamous 'Pajama Man' who, without fail, shows up every Saturday night decked out in full flannel in order to dance the night away? He even has seasonally/holiday themed numbers. My dream is for him and Asian Michael Jackson (also a staple of the Cave) to get married and adopt little pajama clad Asian babies to whom they can pass on outdated MJ dance routines. 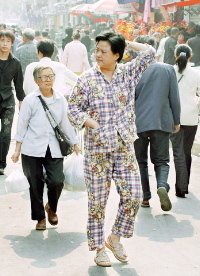 In case you don't believe me Google image search "dance cave pajama man"
O I have heard the stories of Pajama man. I support your dream, as long as they will also have time to care for their dabies inbetween child rearing and dancing!